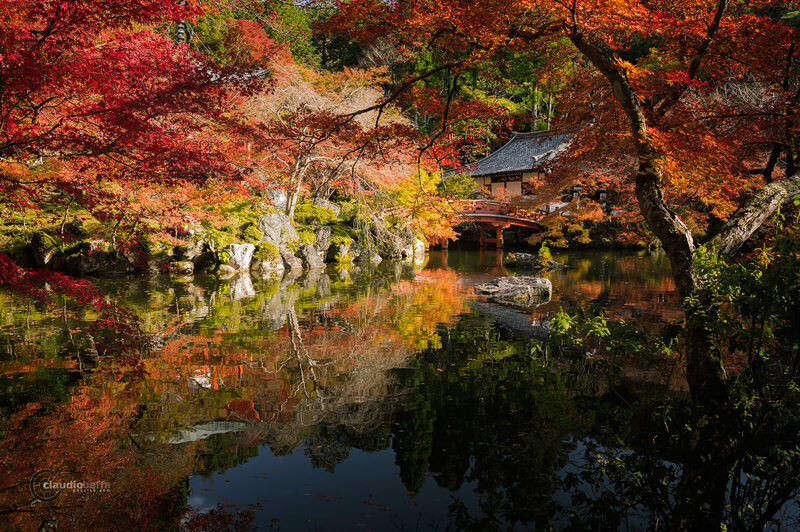 As you probably already know, Japan is an highly desired destination among tourists, travelers and (most of all) photographers, because of the amazing beauty of spring and autumn. Kyoto and its surroundings is obviously one the top choices to enjoy these two seasons in their full glory, there are so many ancient temples and shrines, parks, walks, natural spots that it’s hard to decide which location to pick, all the more so if the season, like last year, is late and short. Moreover the most famous places are generally under siege by hordes of tourists and citizens, so be prepared to sweat in order to conquer your tiny position from where you can enjoy a glimpse of beauty and take a shot. Among the many locations, one of my last year’s selected candidate has been the DaigoJi temple: to be more precise it’s a complex composed of pavilions, hall of lecture, pagodas and other structures in which the monks of the Shingon buddhist sect conduct their activities. Due to its vast extension (it stretches over a mountainside), the temple complex is adorned with different gardens, so during your walk you’ll be able to enjoy the beauty of a bamboo grove (takebayashi), a wonderful landscape-garden of cherry trees (sakura) restored by Toyotomi Hideyoshi, and many walks and spots rich of maple trees (momiji). For these reasons, the DaigoJi is a recommended place to see in every season; strangely enough, it’s never so crowded as other famous but less interesting temples. My first visit to the DaigoJi temple has been two years ago in springtime, mainly as a discovery walk; unfortunately I didn’t have enough time to take many photos and between them there are not exceptional ones, but the beauty of that place convinced me to come back in a more favorable situation. So I had the patience to wait for more than a year, planning the shots I wished to take. So here we are, autumn 2015, crossing the Nio-mon gate (and paying at the same time a quite stiff entrance ticket…) wondering if the colors of autumn will greet our visit. While passing through the bamboo grove and the first halls, we notice that the entire place is very calm and not crowded at all: an ideal condition to enjoy a relaxing walk while snapping some shot. 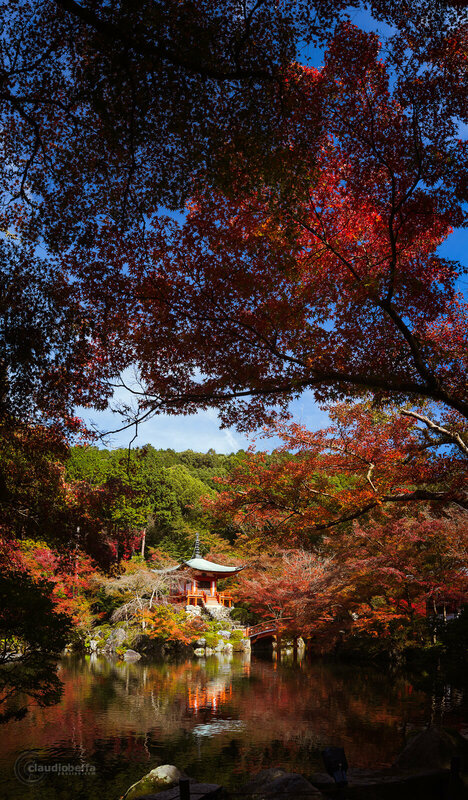 This condition starts to change as we approach the area with the highest presence of momiji trees, that’s also the most iconic location of the DaigoJi: the Benten-do hall. This small pavilion is dedicated to the buddhist goddess Benzaiten, that’s one of the seven gods of fortune and protector of the people, and it rises upon a sort of pedestal made of stones, accessible through a short, rounded bridge; its compact shape, colored with the classical vermilion of japanese sacred structures, reflects itself on a beautiful pond, populated by many carps which, emerging and disappearing hither and yon, resemble elusive spirits. The whole sight is framed by many red momiji, in an amazing explosion of colors that makes me so glad to have had the right timing to catch this chance in a rather short autumn; the other visiting people are as happy as me, enjoying this perfect atmosphere and slowing down a life that in Japan is usually busy and stressful. Therefore, with a smile on my face and a sense of peace, I prepare my gear to take some unique shots and make the most of the evening to represent the beauty and colors of the DaigoJi. I admit that it took quite some time, maybe a bit too much since my better half Sara has impressed in her mind every single square inch of the entire place, but I hope that it was worth it. In any case, in my opinion the DaigoJi temple complex is a highly recommended stopover if you intend to spend some time in Kyoto. 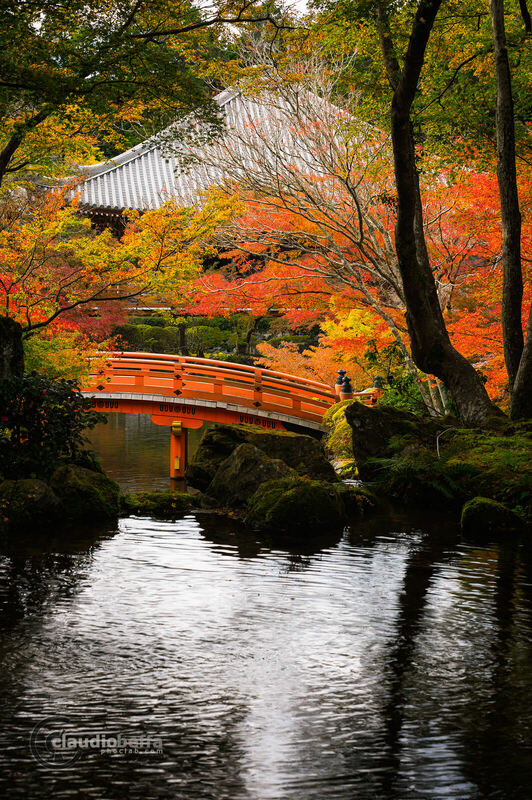 The BentenDo hall, inside the DaigoJi temple complex in autumn, Kyoto, Japan. Maybe you’ve noticed that two of the photos featured in this article have an uncommon aspect ratio: they are a panorama and a vertorama (vertical panorama). These kind of images are useful when you want to capture as many elements as you can of a certain place, to make the viewing experience more immersive. To create these images I’ve stitched together six portrait oriented shots in the first case and six landscape oriented shots in the second case, setting the camera in full manual mode and finding an exposure value that could include all the informations, from the deeper shadows to the highlights. An important piece of gear that I’ve used to succeed in this work was a nodal rail attached to the ballhead of my tripod: its purpose is to shift the center of rotation of the camera from the sensor to an advanced point (it changes depending on the focal lenght of the lens) in order to avoid parallax errors in the following stage of stitching via software. This last step has been accomplished with the use of Hugin, a powerful (and free) stitching software. The resulting image are a panorama of almost 48 Mpixels (10’200×4’600 px) and a vertorama of about 54 Mpixels (5’600×9’600 px), quite some heavy load, since the project files are about 2 Gb big. Nonetheless these pictures can be printed in gigantic sizes and looking at them in full size is undoubtedly a different experience than looking a single shot. I love your photos of BentenDo at Daigoji. We are planning to visit in late November and just wondered if the sun in your shots is the morning or afternoon sun? It is a long way to go, so I want to be there at the best time if possible. Thank you for commenting, I’m glad that you’ve appreciated the photos of the Daigo-Ji and I’m happy to know that you’re going to enjoy the beauty of this place in person. About the shooting hour, I took these photos not long after midday: in November there are not many hours of light (the sun rises at 6:30 and sets before 17:00 approximately). Considering that the sun follows a low-angled arc during autumn (at midday it will be at just 37° of elevation) you’ll not have to deal with harsh light or vertical shadows. 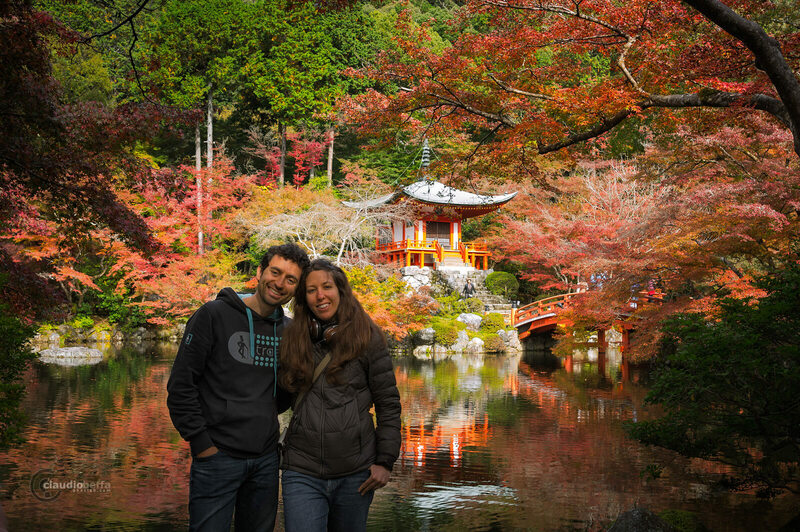 If you wait for the afternoon warm light you’ll be able to capture all the beautiful colors of the garden, especially the vibrant red of the Momiji trees. An important advice: in the recent years the temples and shrines in Kyoto are literally besieged by tourists at any hour of the day, so I suggest you to go well in advance, to find a suitable shooting vantage point and to wait patiently until you’ll have a reasonably clear view.